Boko Haram terrorists are torching people's homes near the Nigerian town of Chibok where they kidnapped 276 schoolgirls. 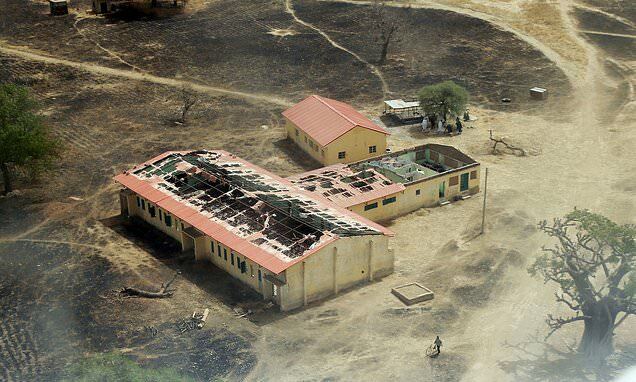 Jihadis are currently setting fire to homes in the village of Mifa, five miles from Chibok in north eastern Nigeria. Military sources confirmed the attack, with local media reports claiming the unrest started this evening. The terrorist group took female pupils from the government secondary school in Chibok hostage overnight on April 14 2014. It triggered a worldwide campaign and international pressure to release them, but 112 are still missing. Boko Haram also razed three villages in Borno state over the weekend, killing two and injuring several others, according to AFP. The jihadists arrived in trucks to attack the neighbouring villages of Dala-Melari, Fuguri and Femari villages, 3.8 miles outside Borno state capital Maiduguri. 'The terrorists fired indicriminately and forced residents to flee,' said militia leader Ibrahim Liman. Liman blamed fighters loyal to Boko Haram factional leader Abubakar Shekau for the attacks. 'Two people were killed and several injured. They completely burnt the villages after looting food supplies,' Liman said. A resident, Modu Malari, said the jihadists invaded the villages around 10pm local time and 'spared nothing'. 'They stole all our food and burnt all our homes. They killed two of our men,' Malari said.